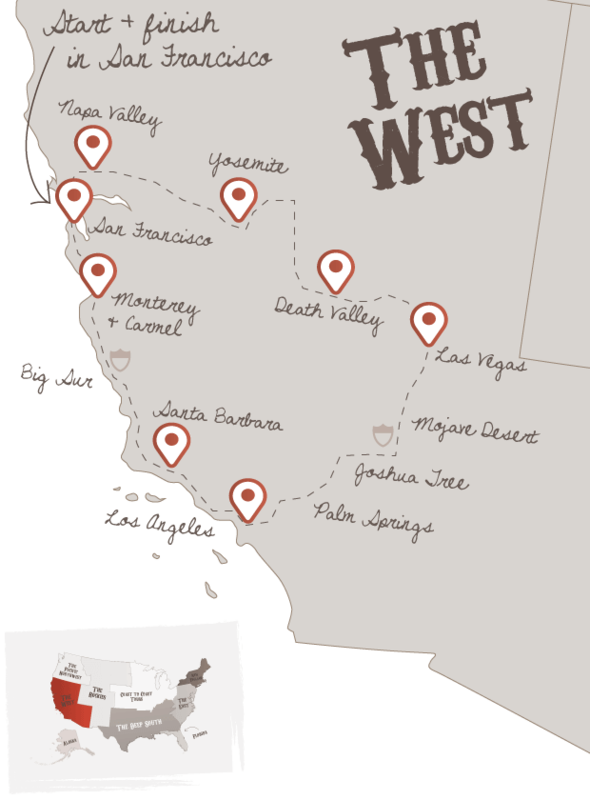 Taking in some of America’s greatest natural & manmade wonders – There is so much to see and experience on this outstanding journey – coastal drives, deserts, mountains and three of America’s best cities. This road trip offers one life-changing experience after another. Please be aware that this road trip is only normally available from mid-May through late October due to snow affected roads in Yosemite. Please get in touch to discuss the other options available if travelling outside of this period. So much to see on just one trip, in a word - WOW! After the fog lifts, one of our favourite cities will be revealed. Ride a cable car, climb the streets and get into the vibe that only San Francisco can offer. Full of Victorian charm, famous movie locations and wealthy tech companies, there is something for everyone in this characterful and cosmopolitan city. Alcatraz, Coit Tower, Fisherman's Wharf and Chinatown are just some of the incredible must-see destinations available to you today. Your Road Trip Pack will help you prioritise all of San Francisco’s visitor attractions, whilst giving you all the information you’ll require to enjoy them. Monterey was once famous for its whaling and sardine industry, it now focuses on marine education and preservation at the world-class Monterey Bay Aquarium. Want to experience the bay area first hand? Take a whale watching trip during spring or autumn. Afterwards, drive the famous “17 Mile Drive” to Carmel-by-the-Sea, this scenic toll road takes you on a short tour past rugged beaches, millionaire homes and wind-blown cypress trees. Seals bask in the sun on offshore rocks and sea otters bob up and down in the waves. Carmel-by-the-Sea has two world-class beaches backed by a gorgeous small town made up of beautiful homes, restaurants and quaint streets. To the north is the world famous Pebble Beach Golf Course and to the south is Big Sur starting with the wild and wonderful Point Lobos. Cruise the classic All-American drive down California’s Highway 1 through the dramatic 90 miles of coastal road that is the Big Sur. Twisting roads curve around the steep cliff faces, gorgeous State Parks and spectacular vista lay-bys that offer views over the vast Pacific Ocean. Get an early start and you’ll have the time to explore along the way. Santa Barbara is an ideal stop off for anyone touring the Pacific Coast Highway. So before leaving, spend the morning in this affluent town, built in a charming Mediterranean style. Then onto LA - Tinseltown is synonymous with glitz and glamour, and although many of the studios have now moved onto to other parts of town it's still fun to visit the home of the Oscars and walk Hollywood Boulevard looking for the handprints of your favourite movie stars. Universal and Disney both have theme parks dedicated to the entertainment industry in the city. For a more authentic behind the scenes tour; Warner Bros and Paramount still offer guided studio visits too.The Getty Center is a favourite of the team at The American Road Trip Company - your Itinerary Pack will help explain how to visit this essential LA destination. On the way to Las Vegas, we recommend swinging by Palm Springs for brunch, before discovering Joshua Tree National Park on your way to Las Vegas. 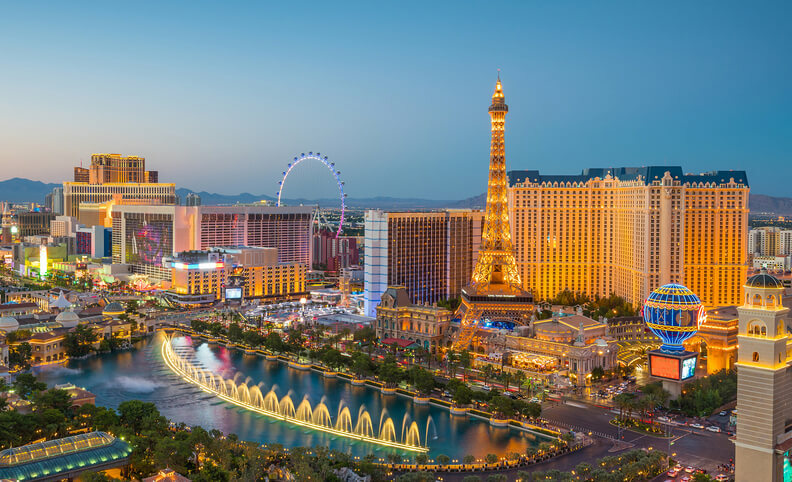 Once you’ve checked into your Las Vegas hotel, get dressed up and hit the tables, bars and restaurants - it’s time to paint the town red. Death Valley has an extreme climate and geology. The roads here are superb, dipping and leaning around curves before straightening out as you dip to 85m below sea level in the salt flats of Badwater. You'll finish your drive on the snow-capped mountains of the Sierra Nevada. It's one of the longer day's driving but carries with it three awesome experiences. Yosemite National Park is nature at its best. The most visited area of the park is the valley floor area with vast rock faces, crystal clear waters, staggering views and stunning waterfalls. Ask us about add-on experiences here to make your stay even more unforgettable. Leave Yosemite for the Napa Valley wine region today as you head west. This area is beautifully manicured and offers fine wine and dining as well as the chance to relax before your flight home the following day. Taking in some of America’s greatest Natural & Manmade wonders - this trip really has it all! There is so much to see and experience on this outstanding journey - coastal drives, deserts, mountains and three of America’s best cities. This road trip offers one life changing experience after another. Don't forget to check out this road trip's Itinerary tab to see more amazing pictures from our "Golden Triangle" tour. You'll also be able to read a little bit about what you'll be getting up to on each day of this incredible road trip adventure.